Today I was honored to join Senators Jeanne Shaheen and Kelly Ayotte, Representative Carol Shea-Porter, and a host of local economic and business leaders to celebrate the opening of a new business development and job training facility that will serve 41 towns and cities in Southern New Hampshire. 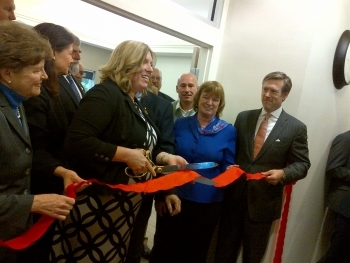 The Regional Economic Development Center of Southern New Hampshire’s new business and job training center is a unique facility. Both business management and workforce training will be delivered in an efficient learning environment. Resources will be provided for entrepreneurs and small businesses to conduct research and receive technical assistance, and space will be available for start-up enterprises to conduct limited business in a professional environment. 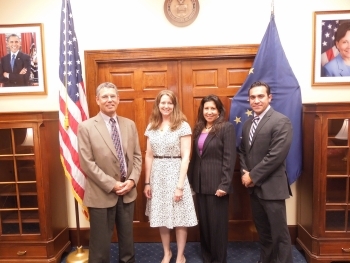 It was my pleasure today to be joined by Aaron Trujillo, the Commerce Department’s Acting Senior Advisor on Native American Affairs - who serves as the primary liaison between the Department of Commerce and tribal leaders of federally-recognized tribes and regional tribal organizations – in welcoming some very special guests from theAssociation of Village Council Presidents(AVCP) of Bethel, Alaska. In recognition of world trade month, May’s edition of Innovate@EDA is focused on trade and investment. A key pillar of the Department of Commerce Open for Business strategic plan, improved trade and investment drives economic growth. It may surprise you to know that EDA plays a critical role in the trade and investment arena. Specifically, EDA investments build and improve community capacity to attract more foreign-direct investment and increase exports. Put simply, EDA enables communities to more effectively compete in a global economy. This month, you’ll read about collaborative efforts at Commerce and with other federal agencies to promote global trade, investment, and entrepreneurship. As you’ll see throughout this issue, economic development at the community level catalyzes impact on a global scale. Elida Alcedo Guardia works as General Coordinator of the Competitiveness and Trade Promotion Program for Panama. She coordinates activities derived from the IDB loan contract #1941/OC-PN. Its mandate is delegated by the Ministry of Commerce and Industry, which is the loan’s main Executor. Before her experience in the public sector, Elida worked in the private sector with the Multinational Nestlé from 1987 until 2000; she left Nestlé to join the family business, dedicated to Agro-industry, Logistics and Real Estate where she worked from March 2000 until June 2010. From March 31 through April 4, more than 50 participants representing government, business, and economic development organizations from 19 countries across the Western Hemisphere embarked on a tour of the American Southeast. The purpose of this trip was to provide a forum to share best practices, foster alliances, and create opportunities for two-way trade. The packed agenda kicked off in Atlanta with visits to the Chamber of Commerce, the Global Center for Medical Innovation (GCMI), the Advanced Technology Development Center (ATDC), and VentureLab. These stops provided participants with a view into how Atlanta has become the number three city for Fortune 500 businesses and a booming medical technology cluster. Participants were treated to a tour of the ATDC facility and offered a glimpse of the innovative companies that are supported by the incubator. Academia, government, and the private sector are constantly puzzling out ways to increase trade and exports. Export policy can be complicated, but increasing exports can be as simple as constructing a new rail spur. In order to achieve the targets for cutting carbon emissions in Germany and in Europe as whole, the use of biomass for power generation is essential. However, the European wood market could not keep pace with the increasing demand for resources in this fast growing sector. Entrepreneurs play a critical role in expanding the economy and creating jobs. EDA, the Department of Commerce, and the Obama Administration are committed to supporting entrepreneurs across the country and globally. In this vein, the White House recently announced a series of new steps to accelerate the success of entrepreneurs in the United States and worldwide. The Presidential Ambassadors for Global Entrepreneurship (PAGE) program brings together a diverse group of successful American businesspeople who have committed to sharing their time, energy, ideas, and experience to help develop the next generation of entrepreneurs at home and abroad. The group is chaired by Secretary of Commerce Penny Pritzker, and the U.S. Department of State and the U.S. Agency for International Development (USAID) are also partners in this effort.